Christians are familiar with the call to share their faith with others. However, in an effort to make the gospel accessible and simple to unbelievers, many have reduced the message of the gospel to a formula: understanding certain verses in the Bible, praying a certain prayer, and so on. Just as some oversimplify the rich truths of the gospel, others make the gospel message convoluted. 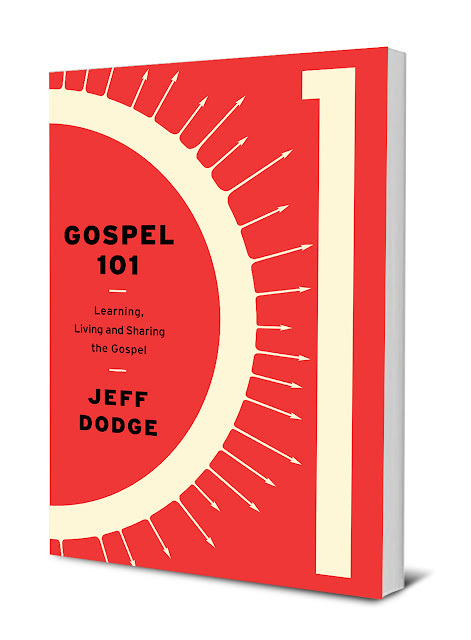 Rather than overwhelming unbelieving friends with an “information overload” approach to the gospel—or a watered-down approach, reducing the gospel to quick soundbites making it seem shallow or trivial—Jeff Dodge presents a third way: communicating the gospel in a way that acknowledges profound depth while also making the message clear, understandable, and compelling. Gospel 101: Learning, Living and Sharing the Gospel (New Growth Press/August 6, 2018), a small group resource on biblically based gospel theology, equips Christians toward biblical literacy to confidently share the gospel, inviting readers to grow in gospel fluency, gospel community, and gospel action. The flexible study group layout encourages readers to put on the mind of Christ, to think on and consider a deeper understanding of the content of the gospel rather than a one-size-fits-all approach to evangelism. Dodge outlines the language of the gospel by exploring the gospel, God, humankind, Christ, justification, our response, and the implications of the gospel—first defining the gospel and explaining why it matters. Dodge set out to build a resource that would provide a basic foundation for this kind of change. As a pastor in a multigenerational church within a university community, Dodge is familiar with this need to spread the gospel message by being in Scripture, in gospel discussions with other believers, and in gospel conversations with people who don’t know Jesus. “In my experience, reaching people for Christ within these contexts requires a grasp of how to particularly engage the ‘marketplace of ideas,’” he says. He continues to share the importance of finding common ground among others’ latent beliefs and redirecting misguided notions toward the Father, Son, and Holy Spirit. The goal of Gospel 101 is to provide a “thicker,” more complete understanding of the eternal gospel, which will lead to a boldness and confidence in telling others the good news they have found in Jesus. This goal is uniquely personal to Dodge because he first heard the gospel—at least, coherently—as a university student. “I was raised as a cultural Christian, but gospel-less,” he said. “The first time I heard the good news, I repented and believed. What I soon discovered was that the gospel was simple enough to understand and respond to in a moment while also being rich enough and full enough to be pondered for a lifetime.” However, Dodge is keenly aware that too often, as we grow to understand more and more about the gospel, we begin to lose our ability to clearly and succinctly communicate the compelling message of the gospel to unbelievers. Jeff Dodge, MDiv, DMin, PhD, is the teaching pastor and director of theological formation at Cornerstone Church in Ames, Iowa. He also directs the Cornerstone School of Theology as part of The Salt Network, a church-planting movement focused on establishing multigenerational churches in major university communities. Jeff and his wife, Teresa, have four children and several grandchildren. New Growth Press publishes gospel-centered Christian books, small group, and children’s Bible resources for discipleship, biblical counseling, and missional ministry. For more information about Gospel 101: Learning, Living, and Sharing the Gospel and other releases from New Growth Press, visit www.newgrowthpress.com.